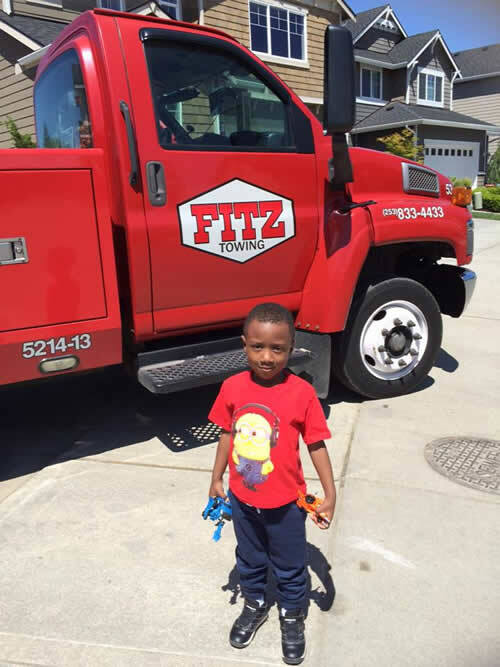 Fitz Towing is a family owned towing company with a half-century tradition of serving customers in King County, Pierce County, and Auburn, Washington with premier roadside support. We have a full line of Light and medium Tow Trucks, and heavy duty wrecker units for towing all types of autos, motorcycles, large trucks, semi’s, RV’s and buses. Our office is open Monday through Friday from 8: 00 am to 5:00 pm and is closed from 12:00 pm to 1:00 pm. It is staffed by professional and friendly dispatchers who will answer your call and immediately send out a licensed tow truck driver. Because we know that the side of the road is no place for you to be, we’ve worked hard to achieve one of the best response times in the towing business. Under normal circumstances, our tow truck driver will arrive at the scene of your accident or car breakdown within 30 minutes. Our main goal at Fitz Towing is to provide a better customer experience by offering prompt response at affordable prices on any towing or roadside service in Auburn. Licensed, Bonded and Insured for Towing and Transport. Prompt Towing and Roadside Service – downtime costs money and our speed saves you money. Trained for the Task – Fitz’s Tow Truck drivers are clean, courteous and certified. Quality Equipment and Facilities – our modern towing equipment and secure storage yards ensure the safety of your asset. The customer service representatives and drivers who make up the towing staff at Fitz Towing are all trained professionals. We run background checks on every new employee, making sure they have a clean driving record and a verifiable employment history. All of our tow truck drivers receive hours of continuous upon hands-on training in the towing of vehicles both small and large. No matter what the size of your vehicle, our tow truck drivers will safely tow it to the destination of your choice. Every week, we receive dozens of unsolicited thank-you notes from drivers all over Auburn. Why? By offering the most affordable rates in the business, Fitz Towing is a name you can trust. Hidden fees and commissions have no place in our established prices. You’ll know exactly how much the towing service will cost before the tow truck driver arrives at the scene of your accident or car breakdown. Experienced heavy-duty tow and Landoll/ lowboy operator. Must have class “A” with tanker, double triple, and hazmat endorsements, along with a clean DMV and the ability to pass a drug screen.